* What starts with T, ends with T and has T in it? * what gets wetter the more you dry? * what do you break before you use? * What gets whiter the more it gets dirty? * What belongs to you but other people use it more than you? Make 12 round balks and flatten on a baking tray. Cook in medium oven, gas 5 for 12 minutes. I put the ingredients in separate bowls, lined them up and asked the kids to taste each one separately. 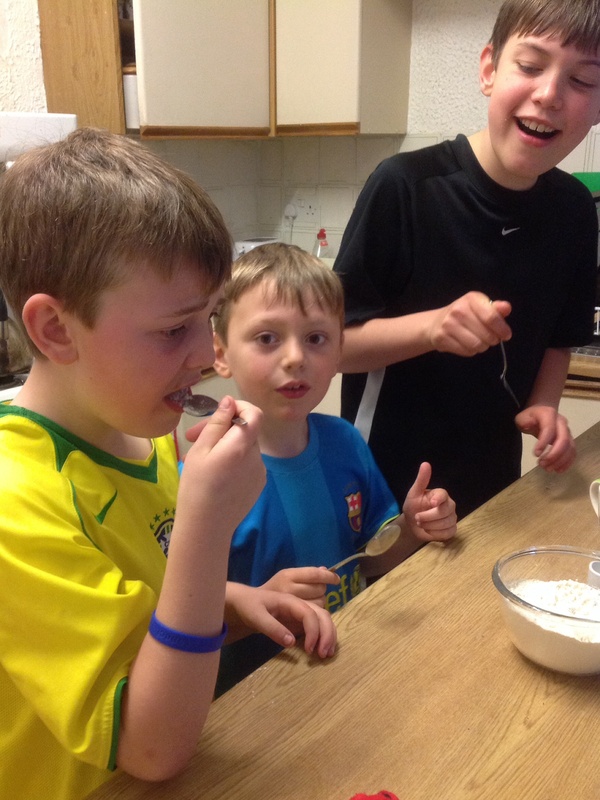 They were all very keen until they tasted the flour and baking powder. The experiment didn’t quite go to plan as one of them ran out of the room in tears as the flour tasted so horrible. After a considerable amount of “tasting” chocolate chips I made the point that God can use all of our circumstances, good and bad and make something good. I reminded them of what Joseph said to his brothers “what you intended for evil, God intended for good”. While we may not always understand why something is happening, we can trust in God who loves us and always works things out for our good and His glory. 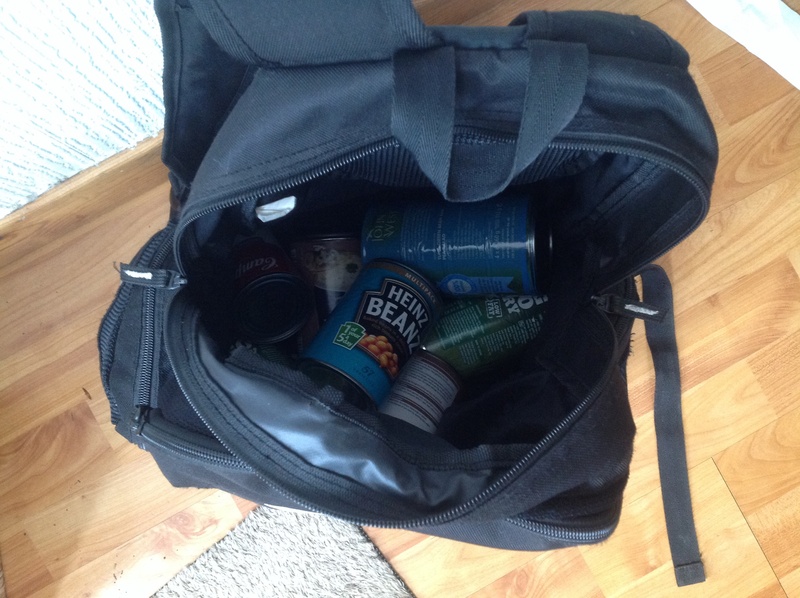 We used one of the kids school bags and got some tins from the kitchen cupboard and I asked them to think of times when they had been hurt by someone and had struggled to forgive. For each example we put a tin in the bag. 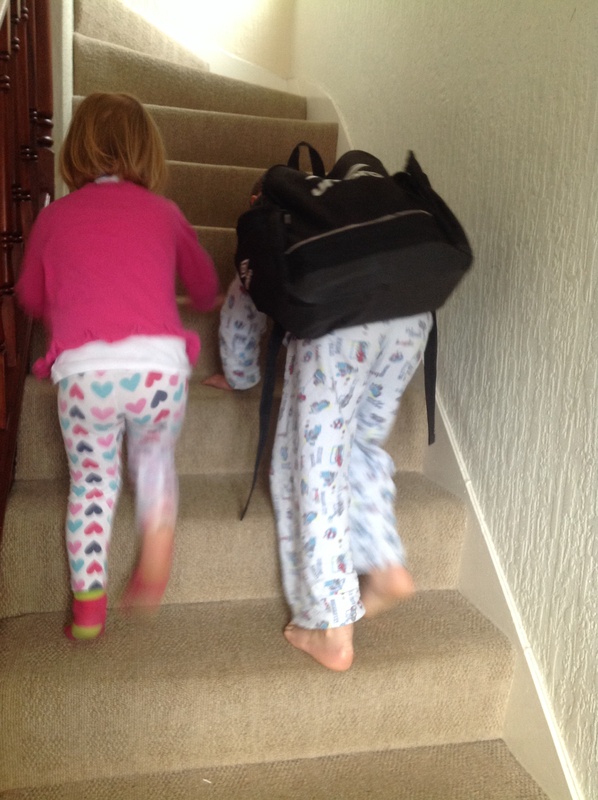 When we had a reasonably heavy bag I asked them to (very carefully) take a walk up and down the stairs. I helped Esther up and down the stairs and pointed out that as much as it is good to help each other in life it is really only with Jesus help that that we can forgive. When they came back I told them the story of Corrie Ten Boom, a Christian woman who survived a Nazi concentration camp during the Holocaust, who said, “Forgiveness is to set a prisoner free, and to realize the prisoner was you.”. 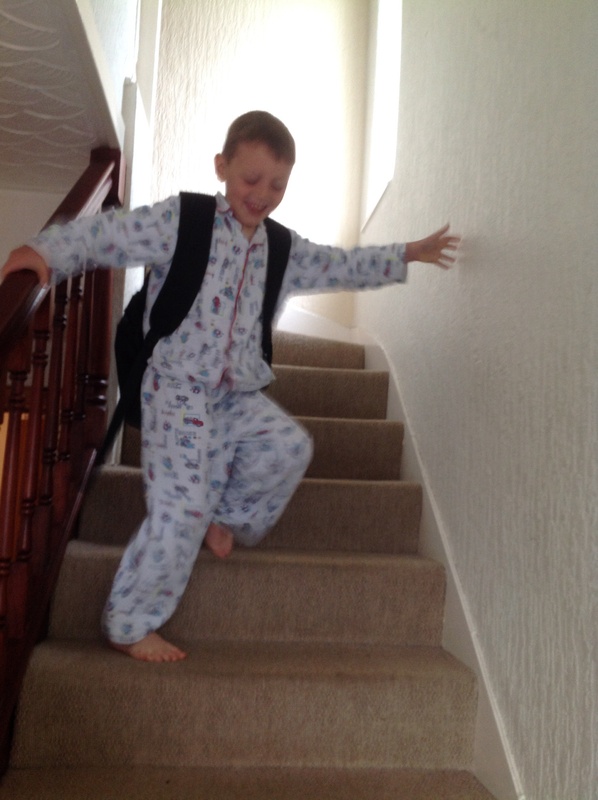 We then emptied the bag and the delight was apparent as Jacob ran up and down the stairs, free from his burden! In fact when I did the activity with the older boys they pointed out that they didn’t even need to even carry the bag! When we hold onto our unforgiveness it’s like walking about carrying a big heavy bag -exhausting work as they discovered. However, when we remember what Jesus did for us on the cross it helps us to forgive others. We can then become free from the emotional baggage that weighs us down. 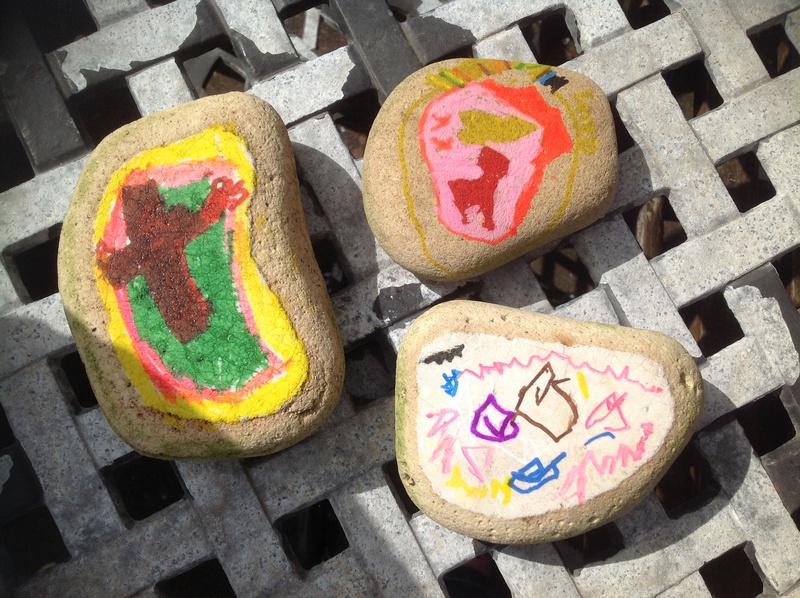 The kids decorated some stones to help us remember how much God loves us. Here are some of the masterpieces. We are all proud of our children’s achievements, from the first steps to writing their names (even if it is on the wallpaper!) and the list goes on. But how do we help them deal with disappointment? As a basketball obsessed family, my boys and hubby play and watch the game – alot! During an NBA match the other day my husband pointed out that a number of the really good players had experienced great adversity in their life and this was a driving force pushing them to succeed. Although as a family we haven’t experienced great adversity, we have like everyone had to deal with disappointment. Recently our eldest son managed to get into the under 12 basketball team as a reserve and while this is a great achievement there was disappointment that he was not on the main team. During this time I have been challenged and encouraged by our sons character, maturity, wisdom and tenacity. The majority of us will not have experienced slavery, false accusations or imprisonment. However, we may experience times of injustice, fear, temptation and pride. Joseph chose to believe and trust that God was with him. But just as important he chose to act on that belief and lived a life that pleased God. One of the key words in this great text is the word “in”. God works in and through any circumstances in our lives. He doesn’t wait until we have overcome a problem, God works out His purpose IN the midst of them through changing our character to become more like Jesus. Hi Irene, yes it’s a bit tricky with the different ages and Stephen is often not there as he has a few sports clubs he attends. I also don’t always do it with all children together. So for example I did the stones in a bag activity with Jacob and Esther (5 and 3years) when older boys were out and then did it again with the Stephen and James (11 and 8yrs). Esther is really too young to grasp most of the concepts but I think it’s good for her to get into a habit of “doing devotions” as we call them. Even though Stephen misses some of the talks I was pleasantly surprised when he said recently I should do bible class on Sundays more like the devotions we do at home as they were more fun and easy to listen to.